New Trinidad and Tobago Football Association (TTFA) president David John-Williams should announce an interim general secretary before the end of this week, as the local football body has found itself handicapped by a debatable, existing arrangement between ex-president Raymond Tim Kee and his estranged former general secretary, Sheldon Phillips. Photo: Ex-Trinidad and Tobago Football Association (TTFA) president Raymond Tim Kee (right) and his estranged general secretary Sheldon Phillips. Phillips, according to TTFA sources, has informed John-Williams that he still has a valid contract which has another two years to run. The suggestion from the controversial general secretary is that, although he serves at the whim of the football president, Tim Kee somehow gave him a contract for longer than his own term in office. And, despite being dismissed almost two months ago, Phillips still allegedly wants his contract to be honoured or to be paid off by the TTFA. 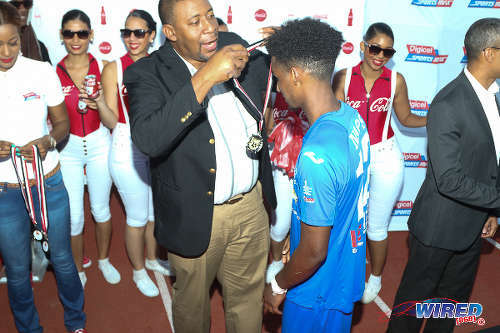 Phillips, the son of former TTFA technical director and star goalkeeper Lincoln “Tiger” Phillips, received a salary of roughly TT$24,000 a month plus a monthly housing allowance of TT$21,000 and a company vehicle. 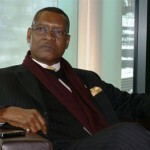 John-Williams declined comment on the matter but admitted that an unresolved issue with Phillips had delayed his appointment of a general secretary. 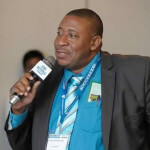 “We are thinking about appointing somebody temporary (for the post of general secretary) between now and Friday,” John-Williams told Wired868, “because the matter has not been resolved with the former General Secretary. 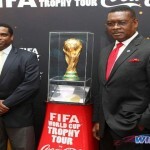 Phillips confirmed that he had what he considered a valid and existing contract as TTFA general secretary. He refused to comment further. Photo: Former Trinidad and Tobago Football Association (TTFA) general secretary Sheldon Phillips. The legality of Tim Kee’s decision was immediately questioned by the TTFA executive committee. 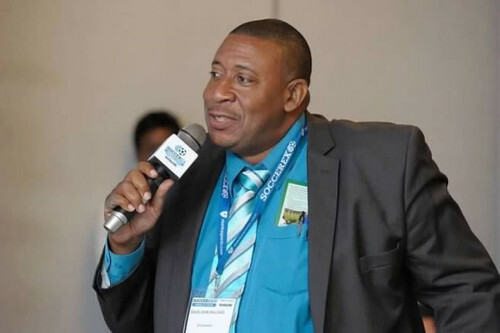 Tim Kee refused to back down on the grounds that the old TTFA constitution did not specifically address how a general secretary could be dismissed but only how one could be hired. And, since Tim Kee never consulted the TTFA’s directors before sacking Phillips, the directors and Phillips himself argued that it was an illegitimate decision. 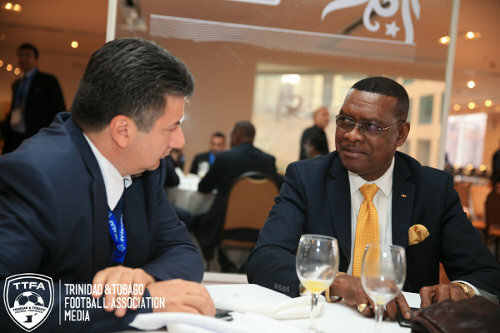 Photo: Former Trinidad and Tobago Football Association (TTFA) Raymond Tim Kee (right) enjoys some conversation at the 2014 FIFA Congress in Sao Paulo, Brazil. However, conversely, a former TTFA executive committee member suggested that, by virtue of the same clauses in the new and old constitutions, Phillips’ contract might have been illegal. 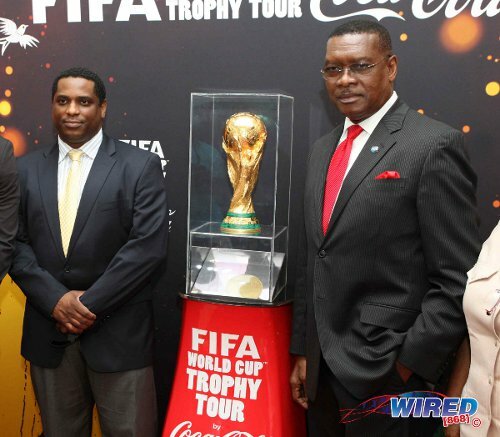 The TTFA executive agreed to Phillips’ appointment in May 2013 but never saw his contract. Tim Kee’s term of president should have ended in November 2014 but, bizarrely, Phillips apparently had a contract that ran until April 2015. And, even stranger, Phillips claimed that, at an unspecified time this year, Tim Kee gave him a two year extension, although his own presidential term in office had just months to run. 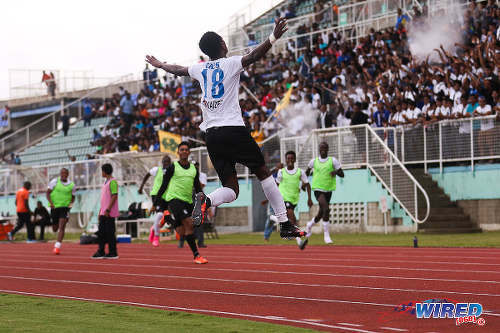 Phillips’ claim has not been supported so far by the TTFA’s office staff, who had never heard about his supposed new contract and did not have a copy of it. 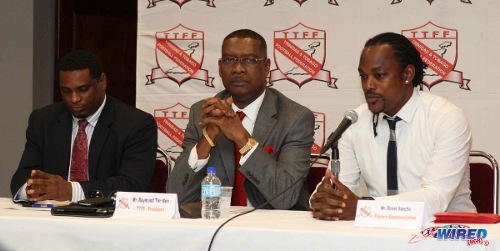 Photo: Former TTFA president Raymond Tim Kee (centre), 2006 World Cup player Brent Sancho (right) and TTFA general secretary Sheldon Phillips address the media in 2013. Thomas, who stepped down as Southern Football Association (SFA) president last month and was replaced by Richard Quan Chan, took a parting shot at Tim Kee for boasting about pushing for a new TTFA constitution. “The erstwhile (former TTFA) president is always going on about how he proposed a new constitution,” said Thomas. “He didn’t propose anything. That was a mandate by FIFA and we were practically threatened by FIFA that, if we didn’t see about it, they would send a normalisation committee. Photo: Former TTFA president Raymond Tim Kee, who is a member of the FIFA Futsal Committee, tries out the furniture at the global football body’s Zurich headquarters. 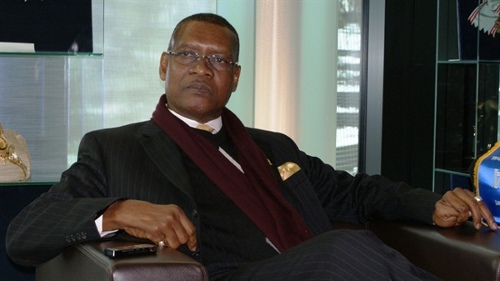 Tim Kee, who is also Port of Spain mayor and PNM treasurer, did not stick around long enough to see the new constitution in action at the TTFA’s election on 29 November 2015. After the first round of voting at the Hasely Crawford Stadium’s VIP room, John-Williams led presidential delegates with 18 votes followed by Tim Kee (13), Taylor (8) and Browne and Ramdhan, who received three votes each. And Tim Kee left the room before the second round of voting and never returned; not even to support his own prospective vice-presidents, Colin Murray, Keston Nancoo and Kamau Bandele, who faced the electorate afterwards. John-Williams was subsequently elected president while all three of his vice-presidential candidates, Ewing Davis, Joanne Salazar and Allan Warner, were also elected. 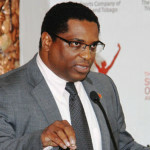 Photo: New TTFA president and ex-DIRECTV W Connection president and CEO David John-Williams. John-Williams confirmed to Wired868 that the outgoing president never contacted him to offer congratulations on his new post. Although the new TTFA president has not yet named his potential general secretary, current Secondary Schools Football League (SSFL) general secretary and San Juan Jabloteh CEO Azaad Khan is believed to be favoured for the post. Khan is part of the SSFL executive committee, headed by president Anthony Creed, that recently landed a multi-million dollar five year contract with Digicel SportsMax, which starts in 2016 with a TT$1.4 million payment and gradually increases annually to reach close to TT$2 million by the final year. 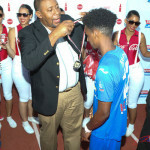 The deal includes weekly broadcasts of SSFL matches throughout the Caribbean region and in the United States and Canada as well as coaching programmes, all star games and increased social media presence. The new SSFL contract also allows the football body to continue to engage title sponsors like First Citizens Bank. Khan told Wired868 that the SSFL board will sit down early next year to decide how to use the sponsorship money to attain particular goals for the schools’ game. The factual inaccuracies in this article are stunning. It would be interesting to see if you could back up this claim. This fool has to produce documents stating as such. Plus if the incumbent ‘Kee the thief’ is no longer a member of the organisation because his term has ended …. Phillips is obviously gone …seems to me whatever issues he has, has to be taken up with Kee. I don’t get that Tim Kee and Phillips can apparently keep match contracts and job contracts between themselves alone. No fiducial responsibility to their organisation it seems? Lassana I’m pretty sure they can’t….they’re simply taking advantage of our naivety and our tendency to not take them to task for the underhanded things they do. But a verbal declaration won’t hold up in court ….he needs documented proof and even so his term can’t run over Kee’s term unless the new board selects him. It says a few things …first of all perhaps Kee was expected to be there that long ….which means things were in order to perhaps prevent an election so they probably felt that they could tweak the nature of things with an out of order contract like that. Secondly 24000 a mth plus 11000 for housing allowance? They’re paying this man salary and rent but can’t pay the coaches, players or fund events add to that they blame the ministry of sport for not funding the team for tournaments? ….. dude I’m flabberghasted……. What’s the legal basis for your positions Malik? Because I can tell you that you’re wrong, and you know me, I don’t comment on things I don’t know about. ..Aaah. Now THAT is another matter. And I couldn’t agree more..
Lol. Yes, we don’t know all the facts Keith. But I feel we can take a few lessons from this in terms of how the last president and general secretary operated. I hope it is not repeated. You hearing yourself and not me Lasana. Once again. I do not know any of the facts. They must be established and on that basis the new Board will act. I have no stake here. This is a discussion in a vacuum. Not to say a vacuous discussion. LOL..Oh, the irony..
Well, I hear alarm bells if the general secretary can legitimately sign a contract with the president and nobody needs to know about it except for those two. And since the general secretary has left office since October 20. And he has not instructed anyone at the TTFA headquarters to produce his contract. Does that mean he keeps it at his home? No alarm bells there either? It is not the staff that would keep copies of contracts. That would be the job of the very GS, who would keep copies of ALL contracts. Such documents are not left in the hands, computers or filing cabinets of office staff. I doubt very much said staff have a copy of Hart’s contract..
Why do you say that Keith Look Loy? It is the staff that keeps all receipts and so on including contracts. If you were national coach, it would be the staff that has your contract. Why would Raymond Tim Kee keep all contracts at his home? ..The office staff not hearing about an extension says nothing. To whom did Tim Kee deny granting Phillips an extension? In real terms that is not their business. We agree on the possibilities for the next step.. So why Philips wait for now to talk about contract ??? Why didn’t he say something to Tim Kee and the media two months ago ??? Money….money…money…it’s all about the money !!! His initial contract expired in April 2015, which, incidentally, was after Tim Kee was due to face the electorate in November 2014. Now Sheldon Phillips claims he got a contract extension until 2017. The TTFA executive committee approved his initial appointment although it never saw his contract. But the ExCo never heard about an extension and said that it would be illegal as a result. Also, the TTFA office staff has never heard about an extension and, apparently, Tim Kee denied granting an extension. But then he has been caught lying before. So, the questions for DJW, in light of those circumstances: Does he keep Sheldon Phillips until 2017? Does he pay him off at $45,000 a month for three years? Does he offer a financial settlement? Or does he tell him to go screw himself? Somebody other than SP has seen this extended contract? Nobody I spoke to. And I’m not sure he has produced it either. Or at least not yet. He worked with the full knowledge of the ExCo after his contract ended. I seriously doubt that he can get 3 years payoff but the EXCO cannot now claim that they didn’t know he was extended as he was working past that point with them. Kendall Tull, Stephen Hart’s contract expired in July. And there is law that governs people who work after their contract expired. Because he is working after his contract expired does not mean he must have gotten a new one secretly. That isn’t so. He just needs to produce the contract. He isn’t legally entitled to anything if there is no signed document with a TTFA letterhead. And he can’t hold the new executive in limbo without a signed contract. The constitution says that he can only be appointed by the executive committee. Now I am assuming that the same process would apply for an extension. But I’m a bush lawyer on that. The question will be if the executive committee is needed to authorise an extension of the general secretary’s contract or not. It seems silent on it so if the TTFA Executive Committee seeks to grant extension. .on what legal basis is it so doing?May have to seek a legal opinion or go to court for a ruling on the legality of the contract.Court can rule that contract valid and subsisting or otherwise void /void able. That isn’t what I said Lasana Liburd. I’m not sure where we lost each other there Kendall. But consider that in this situation, Raymond Tim Kee and Sheldon Phillips routinely kept job contracts and match contracts between themselves and away even from office staff. I hope the new TTFA president is prepared to find and provide answers yes. In this case, the TTFA ExCo is saying that since they didn’t see new contract, it cannot be valid. Not sure what David John-Williams’ take on it is. When did they ask to see it? Since May? #BushLawers quarreling is the worrrrse thing eh? ..Lemme try again. We don’t know the facts. I am saying the facts have to be established. Did the old ExCo not know of the purported extension? Or did they? Does it exist? Based on that, the new Board has a choice to make:1) honour it; 2) pay him off; 3) bring Tim Kee’s case against him to free up the position. I hope my thinking is clear now.. Note that I was referring to the original appointment initially. The Executive allowed Phillips to operate in the post. You cannot do that and then claim that the person was improperly appointed. If he worked past the point of his original appointment and the Committee was slient on the matter, they cannot claim that they did not know after the fact. When was his original contract due to end? But how can his extension be legal if only the executive committee had the authority to grant it and they never saw it Kendall and Keith? ..My point exactly. TTFA must prove he does not have a valid contract. Bring him back in. Bring a successful dismissal case against him. Or pay him off..
Phillips was working so you cannot now claim he was improperly appointed. The extension is another matter but he was certainly improperly dismissed. These parasitic juveniles ….can’t we be rid of these buffoons? For peace sake just go away ! It is important though because we are in danger of repeating the same mistakes. I am not overlooking the drama with the current situation. ..The facts cut both ways. It Tim Kee had no power to dismiss Phillips because he was the appointee of the old ExCo, so too the new Board has the power to appoint the association’s GS. If Phillips claims has a valid contract that overlaps both dispensations then I imagine he could produce it. If it is valid it must be honoured – even if John-Williams wants to replace him. Unless, of course the new Board could successfully bring Tim Kee’s case against him? Oh, the irony.. The validity of the contract itself is questionable. As well as the mysterious manner in which it appears to have been given to Phillips. If it was given at all. And, of course, I wait to see if the general secretary walks out with a pay off in the context of the three year term we just witnessed. It is like the President appointing the Cabinet on the recommendation of the political leader. We’ve seen what happens when the President tries to intervene there. But I find that to be a side topic anyway Kendall Tull. That isn’t what I read Lasana. I read the Executive Committee appoints the General Secretary on the recommendation of the President. That is not the same and the fact that people insist on interpreting the matter in that manner doesn’t fill me with hope for the future. You don’t see anything wrong with a government giving members of a state board contracts that are longer than five years? Chabeth Haynes as far as I am aware, contracts in state bodies run up to 5 years? If it’s longer, what is the purpose of contract; the person have almost a permanent job. That’s not the comparison here. Contracts in State companies regularly outlive the government of the day due to timing. In any event, this is not the same and it is not what I said. I think we are looking at the policy of having State boards last for no longer than the duration of the government in office and why it is not as far fetched as Kendall suggested. It happens all over the world with Ambassadors and many State appointments. Makes perfect sense to me for certain positions. Huh? Ambassadors get recalled with every change in government. All over the world. That’s how politicians are able to promise high profile supporters and financiers ambassador positions. In any case, the issue isn’t about what happens but about what should happen. The question is whether someone elected to the head of a public entity should offer a close employee a contract that extends beyond the elected official’s term. That’s the issue. The Board is one thing but the actual persons working in the company regularly outlive the Board. Phillips is an employee of the TTFA. You all are not grasping that aspect in my argument. The English FA has had Secretaries and CEOs that served multiple Chairmen throughout its history. What’s the problem with that? The president may choose to keep the CEO. But the holder of that position is expected to work closely with president and implement his policy. Standard practice is that all persons at that level offer their resignations and the incoming boss decides who he wants to keep. You know that is barely a half of the issue here eh Kendall Tull. And, according to the constitution, the general secretary does serve on the whims of the president. You might not like it. But that is what it is. Still, like I said, that isn’t even half of what is wrong with this picture. Your understanding is so shallow at times it’s not even funny. If “the general secretary does serve on the whims of the president” then the President would not need to consult anybody whether to hire or to fire him. Clearly, not under the old Constitution, nor under the new, does the President have unilateral power of appointment, nor by implication, he does not have the unilateral power of removal, a fact already confirmed by FIFA to the ExCo. Since the new Constitution was not ratified by the membership until the AGM last month, the old Constitution governs the situation. Tim Kee has already conceded that he lacked the authority to remove Phillips. As for the contract, all Phillips has to do is produce the written extension, or produce parole evidence of the facts giving rise to the extension. Such facts, may or may not be in writing. “Bush” lawyers like yourself, are weighing in from a position of ignorance, some of you saying that unless it’s in writing it’s not enforceable… as though the 2006 WC players had a written contract with the TTFA. Amazing what I does read sometimes. Kendall Tull and a few others have the right idea, Tim Kee has the authority to extend the contract, since an extension is neither an appointment or a removal and the GS’s service initiation or termination could only originate with him. No other party has a say on anything else in between. Whether it was smart of Tim Kee to extend him or not is a separate matter from the validity of the contract itself, and is not something a court would consider, since what’s “smart” and what’s “lawfully permitted” are two completely different matters. A court will only rule on the latter and leave it up to the parties to figure out the former. This is all ridiculous. I see nothing wrong with the term of the General Secretary running counter to the President’s term. The General Secretary does NOT serve at the whim of the President any more than a CEO is beholden to the Board that appointed them in the first place. 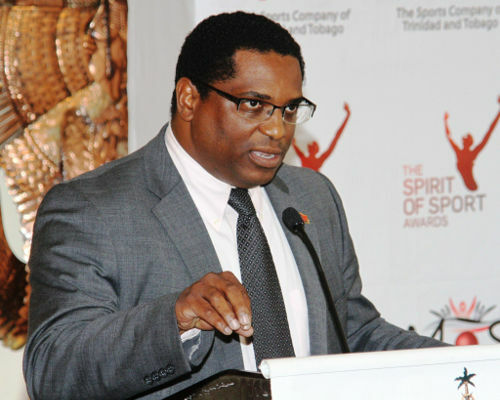 The General Secretary is a servant of the TTFA. He is appointed by the Executive Committee to manage the day to day operations. He is not supposed to be the lackey of the President. New Reality TV series in de works: “Keeping up with the TTFA”. Was that contract extension given on November 28th? Lol. The TTFA can afford to pay remuneration 50K a month for a general secretary?! So why the need for government subventions every other Tuesday afternoon?! I really hope DJW can make real change happen at the TTFA yes. The general secretary says he has a contract that nobody else at the TTFA knows about… Good luck to Port of Spain with its mayor eh. Ha, TT were that close to a normalization committee smh..